LEE BRADBURY has hailed the Hawks’ capture of former Bournemouth and Doncaster Rovers striker James Hayter. The Westleigh Park side yesterday completed the signing of the 36-year-old, who was released by Yeovil Town at the end of last season. He joins fellow hitmen Marvin Morgan and Matt Paterson in sealing moves to the Hawks this summer. Hayter, who originates from the Isle of Wight, scored 93 goals in 359 appearances for the Cherries, before netting 33 in 162 for Donny. At Yeovil, he netted 25 times in 119 games but has now agreed to drop down into National League south with the Hawks. ‘It’s another huge signing for us,’ said Bradbury. ‘James is a player who has scored throughout his career and will bring a lot of experience to the side. ‘He’s moved to the area and phoned to see if we would be interested. Meanwhile, fellow Hawks new boy, Paterson, can’t wait to get started after moving from Gosport Borough. The 26-year-old is itching to hook up with his new team-mates ahead of the forthcoming campaign. Paterson formed a deadly partnership with Justin Bennett last season, scoring nearly 60 goals between them. And the front man is excited by the opportunity being offered to him at Westleigh Park. ‘I am buzzing and can’t wait to get started,’ he said. ‘After meeting and talking with Lee Bradbury, I am convinced it is the right move for me. ‘He talked about the potential of the squad he is putting together and the ambition at the club. ‘There is a feeling they want to do something special next season and he felt I could add to that. ‘The move to the Hawks can help me develop as a player and, hopefully, prove a stepping stone to higher things. ‘Over the last few years Bradbury has had a great track record for developing players, with a good number moving up into the Football League. 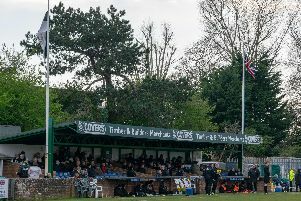 Despite only spending one season under Borough boss Alex Pike at Privett Park, Paterson admitted the decision to move on wasn’t an easy one. ‘Everyone at Gosport was brilliant to me and they helped restore a lot of my confidence,’ he said. ‘As a striker it is often all about confidence in front of goal. ‘It was very tempting to stay. I had a terrific season with them and felt we were unfortunate to miss out on the play-offs.